One of the most important requirements for safe driving is having a clear view of the road ahead in all types of weather and driving conditions. We all understand the importance of a clean windscreen; yet often neglect checking that our windscreen wiper blades are in effective working condition –until we need them and it is too late! In this section take a closer look at how a better understanding of and a bit more attention to windscreen wipers will enhance our safety on the road significantly! What is a windscreen wiper? A windscreen wiper or windshield wiper is a device used to remove rain and debris and sometimes even snow and ice from a windscreen or windshield. A wiper generally consists of an arm, pivoting at one end and with a long rubber blade attached to the other. The blade is swung back and forth over the glass, pushing water from its surface. The speed is normally adjustable, with several continuous speeds and often one or more "intermittent" settings. Most vehicles use two synchronized radial type arms, while many commercial vehicles use one or more pantograph arms. Most windscreen wipers operate together with a windscreen (or windshield) washer; a pump that supplies a mixture of water, alcohol, and detergent (a blend called windshield washer fluid) from a tank to the windscreen. The fluid is dispensed through small nozzles mounted on the hood. Conventional nozzles are usually used, but some designs use a fluidic oscillator to disperse the fluid more effectively. Most modern vehicles are now available with driver-programmable intelligent (automatic) windscreen wipers that detect the presence and amount of rain using a rain sensor. The sensor automatically adjusts the speed and frequency of the blades according to the amount of rain detected. These controls usually have a manual override. Windscreen wipers often endure extremes of temperature, from sub-zero winter weather to scorching African sun. They may have to operate for hours at a time and are then quickly withdrawn out of sight and too often forgotten. What does our National Road Traffic Act require? National Road Traffic Act - Regulation 203. No person shall operate on a public road a motor vehicle with a windscreen which is not fitted with at least one windscreen wiper which shall be capable of operation by other than manual means and shall, when in operation, wipe the outside of the windscreen directly in front of the driver, continuously, evenly and adequately: Provided that the provisions of this regulation shall not apply to a motor cycle, a motor tricycle or a motor quadrucycle without a fixed hood. There are many different types of wiper blades from a variety of manufacturers. What are the qualities that are required for these blades to work effectively? The slope and area of the windshield: Today's windshields are more sloped for improved aerodynamics. A sleek "cab-forward" windshield with a lot of glass area directs more wind against the wipers, which can force the blades away from the glass at high speeds unless the wiper system is designed to resist lift. An aerodynamic, low-profile superstructure and a heavy gauge steel frame providing improved stability and virtually eliminate blade lift-off at high speeds and in stiff winds. The amount of spring tension on the wiper arm: This is important to keep the wiper refill in tight contact with the windshield and provide a superior squeegee effect. Some blades incorporate a balance-beam design with a multipoint suspension system to eliminate smearing and streaking in both directions. The number of pressure points or claws holding the blade: The more claws a blade has, the broader the area over which the pressure of the wiper arm is spread. More claws also provide increased flexibility so the blade can more easily follow the curvature of a large, sloping windshield for full side-to-side contact. Flexibility to maintain proper blade contact with the windshield. The material used in the blade itself - There are many types of compounds although mostly made of natural rubber. Some newer synthetic compounds provide superior blade flip-over flexibility in hot and cold weather extremes. The best compounds reduce windshield "chatter" and lengthen blade life by reducing fatigue attributed to abrasion, temperature extremes, UV, ozone, acid rain and road salt. Motoring experts advise that wiper blades be checked every six months and changed at least once a year. The driver may notice a change in driving visibility and there are usually a few signs to alert to problems such as streaking, skipping, chattering, wearing and splitting – all leading to reduced visibility and slowed reaction time while driving. Should you notice one of the signs of a damaged wiper blade as listed below, then your wiper blades or wiper arm should be replaced immediately. Lines: Fine semi-circular lines of water are left on the windscreen when the wiper blades harden or become damaged with age. Skipping /Lace curtains: Occur where arm defects or long periods in the park position can deform the wiper blade lip causing a veil effect across the windscreen. Squeaking or chattering sounds are usually signs that the wiper element is deformed or hardened or that the wiper blade structure is worn. If left unchanged for too long, the material of the blade can shred and break loose from the arm. Excessive vibration: Deformed wiper element, the wrong adaptor or aging and wear of the blade rubber and links can result in jerky and sometimes noisy wiper arm movement. 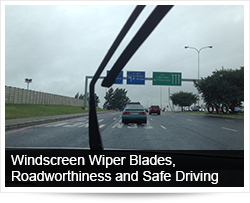 Hopping: Deformed wiper elements, worn blade linkage or a change in wiper arm characteristics can cause wiper blades to judder across the screen leaving behind radial streaks. Lifting: If high speeds persistently cause the wiper to miss out parts of the windscreen, either the wiper blade or the wiper arm should be replaced. Heavy use is hard on the wipers because dust, abrasives, road grime and bug juice wear away the cutting edge the blade needs to wipe cleanly. Road dirt acts like an abrasive to wear away the flat surface necessary for a good squeegee effect. Exposure to sunlight and ozone cause the wiper blades to age, even if they're not used much. Freezing temperatures make the rubber in your wiper blades hard and brittle [stiff and easily fractured], which increases their tendency to crack or tear. Hot weather warps the rubber and prevents the blade from wiping your windshield cleanly. Rubber deteriorates over time. As blades age, they lose their flexibility and are less able to wipe cleanly. They may develop a permanent set or curvature, which prevents full contact with your windshield. Remembering to maintain wiper blades regularly can maximize visibility, efficiency and reliability. Checking for wiper blades should be part of the regular preventative maintenance plan. As part of maintenance we should consider not only the wiper blades at the front but also the rear wiper! Also check the windshield washer pump, hoses and fluid. Do not use the wipers to clear mud and soil from the windscreen – these could scratch the glass. Try to park your vehicle undercover during extreme weather conditions – both in the cold and scorching sun! Clean your windshield every time you fill your tank with fuel. Wipe the rubber squeegee regularly and gently with a damp paper towel to remove any loose dirt or oil. Don’t use your windshield wipers to de-ice your windshield. Rather use an ice scraper or use your defroster to melt snow and ice. Pull wiper blades away from the windshield during winter months to prevent ice build-up on the rubber squeegee and to prevent them from sticking to the windshield. We need to recognize that we do not always use our wiper blades – but they become extremely important to us when driving in adverse weather conditions! They need to be checked regularly – waiting until they fail is dangerous and risky for all road users!